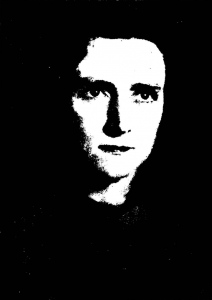 Thelma Stevens, Board of Missions of the Methodist Episcopal Church , “Mission Photograph Album – Portraits #05 Page 162,” UMC Digital Galleries, accessed November 8, 2017, http://catalog.gcah.org/omeka/items/show/60271. 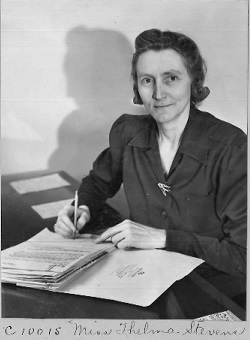 Thelma Stevens, 1902-1990, became a mission legend across the 28 years (1940-1968) she served as secretary for Christian social relations of the Woman’s Division of the Board of Missions of The Methodist Church, her years in that office exactly paralleling those of that denomination’s existence from its unification of northern and southern branches of American Methodist to the action forming The United Methodist Church. She was an unrelenting champion for racial justice, international peace, and women’s rights. Both prophet and gadfly, she became social action heroine to young Methodists engaged in the civil rights and feminist struggles of the 1960s. She grew up in Mississippi in a family she described as “poor white farmers.” Three of her nine brothers and sisters died before she was born. From an early age, Thelma was bothered by the difference between the treatment of blacks and whites in her rural community. She was especially troubled by the treatment of the black inmates on a prison farm down the road from her home and of the poor quality of education offered to African American children. She worked as a teacher even before graduating from the then State Teachers’ College in Hattiesburg. At college, she set her heart on working for the YWCA, one of the few organizations working to overcome the impact of segregation and Jim Crow laws in the South of the 1920. She was surprised to receive an invitation to do graduate work in preparation for becoming a deaconess from Scarritt College, newly organized in Nashville by the women’s mission organization of the Methodist Episcopal Church South. She recalled in a lengthy 1972 interview that the thought of the church as a career track had never occurred to her; she found the church she knew irrelevant to her concerns for race relations. But she accepted the offer to earn a master’s degree from Scarritt, only to be told upon graduation that she was unqualified on health grounds to be commissioned as a deaconess; ironically, she lived to be 88 years old. She was offered the job of director of the Bethlehem Center in Augusta, Georgia, which in 1910 had become the first of a network of African American community centers established by the Woman’s Missionary Commission of the MECS; she held the post for 11 years, until in 1939 she became director of Christian social relations for the women’s missionary organization of the Southern Church. That assignment led in 1940 to the comparable role in the Woman’s Society of Christian Service and its administrative unit, the Woman’s Division of the Methodist Board of Missions. Thelma was unceasing in here opposition to segregation and racism within both church and society. She became active in the Southern Regional Council, an early civil rights organization, while living in Augusta. Within the Woman’s (later Women’s Division), the mission board, and the church at large she crusaded for full racial inclusion. “At the 1944 General Conference Thelma Stevens, a young woman from Mississippi, stood and spoke in support of a request that committees of the church meet in places where African Americans could be hosted as well as whites. In 1978, the Women’s Division published Thelma’s book, Legacy for the Future: The History of Christian Social Relations in the Women’s Division of Christian Service, 1940-1968, that is part organizational history and part personal memoir.